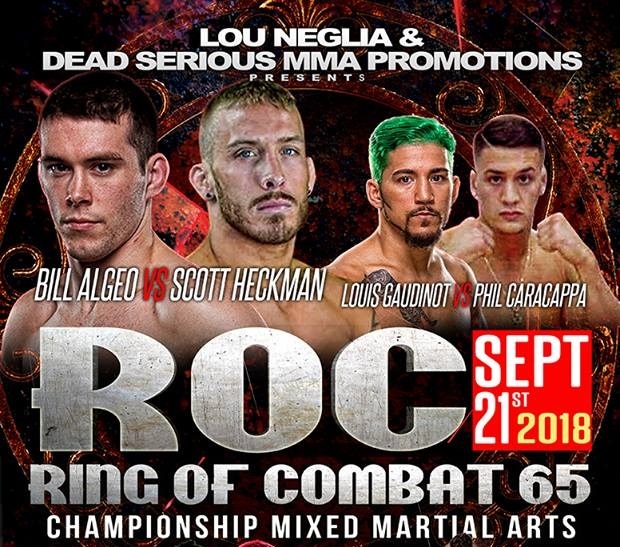 ROC 65 Algeo vs Heckman is another in a long line of events from Louis Neglia that highlights some of the best mixed martial artists in the area. With three title fights on tap, the chances are very high that the UFC has it’s eye on this loaded fight card and will look to bolster their roster as it has done many times with previous ROC champions. The main event is a battle of champ vs champ as the defending ROC featherweight title holder, Bill ” Senor Perfecto” Algeo welcomes Maverick MMA champ, Scott “the Animal” Heckman to the cage. Undefeated bantamweight title holder Phil “the Hitman” Caracappa is challenged by UFC veteran Louis “Good Night” Gaudinot and in the welterweight championship, Sydney Outlaw will defend against Krzysztof Kulak. Outlaw scores an early takedown. Into half guard and Outlaw is landing some ground and pound. Back to the feet. Caracappa comes out aggressive and landing. Secures a takedown and some nasty ground and pound. Back to the feet. Caracappa rocks him with a right. Dominant thus far. Gaudinot is holding on as Caracappa is on top. Could be a 10-8 round. Caracappa was all over Louis. More of the same in second round. All Caracappa on the feet and scores a couple of takedowns. Round 3 was back and forth and Caracappa had to escape a tight guillotine. Crowd on it’s feet and going wild. Gaudinot spending much of the round on top but not doing much damage. He’s going to need a finish. As the final bell sounds, the place is bedlam. Going to the judges scorecards and the results are all for the Hitman..29-28 29-28 29-27 as Caracappa remains undefeated and retains his belt. Ring announcer Peter Neglia declares this fight one of the best in the history of Ring of Combat. Heckman scores a takedown right away. Algeo back to his feet. Another Heckman takedown. Back to the feet again. Algeo scoring in the clench with punches to the side of the head. A lot of clenching going on. Back to feet. Algeo rocks Heckman with a left. Great first round. Heckman may have won this round with multiple takedowns but did not do much damage however he controlled most of the round’s positioning.